Time to write something about those enigmatic burnt mounds. In the news recently, yet more burnt mound sites have been uncovered in Galway, Ireland, during road works for the N17. So it seems apt to be writing about them. It's not easy to find a typical picture of one of these sites. On Orkney and Shetland, the buildings were often made of stone, so the footings survive in the ground. In the rest of the UK, timber was used as a building material. And that does not survive well in the ground. All you get is postholes, if you are lucky, the remains of a wood lined trough and a pile of fire cracked rocks - the burnt mound. An important feature of these sites is the large, deep trough. It might be lined with wood, or with stone. The picture below shows the excavations by John Hedges, around 1975, of a stone building at Liddle on the island of South Ronaldsay, Orkney. In the centre, they were surprised to find a huge stone lined trough. Radiocarbon dates from organic material within the trough tell us that it was in use about 3000 years ago, in the Bronze Age. - they were used to cook meat. The idea is that you wrap a big piece of meat in straw and leave it in the heated water trough for several hours. You probably have to keep putting more hot stones in, as the water cools. There are easier ways of cooking meat. - they were a sauna or sweat lodge. I don't understand this. In my experience, a sauna has a few hot stones upon which water is splashed to make steam. You don't need a large trough of water and lots of hot stones. - you can wash sheep fleece or wool in them. This seems to be a practical idea. Fleece must be washed before it is spun into wool for clothing. The picture below, showing Tony Sherratt and Keith Prosser of Timezone washing a fleece, gives an idea of the size of one of these troughs. None of these suggestions are controversial. Most people reckon that the troughs would have been multi functional - a bit like the kitchen sink only much bigger. When it was suggested that these sites could have been used for making beer, some archaeologists became ever so slightly annoyed. Although the idea was first put forward in 2007, backed by successful experimental work and sound brewing theory, it is still considered by some to be controversial. I don't know why. Hot rocks are ideal for heating large amounts of water to the perfect temperature for mashing, which is between 65 and 67 degrees Centigrade. Getting the water much hotter than this is very difficult. We found it impossible to get the water to boil. 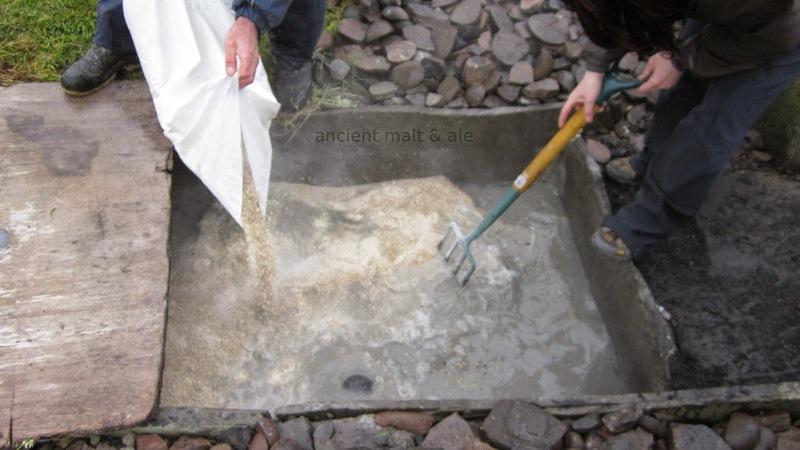 The possibility that they were used in the making of ale or beer was first suggested by Declan Moore and Billy Quinn of Moore Archaeological and Environmental Services Ltd. I first met them at a Conference about beer and brewing in prehistory and antiquity, held in Barcelona, October 2004. I gave a paper about the importance of malt in the brewing process. Billy and Declan asked me whether it was possible to make beer in a hole in the ground. We agreed they should have a go. The following year, they came to Orkney to meet Graham and to learn a bit more about how to make ale and beer from the grain. They tasted the wort and were surprised how sweet it is. They tried Graham's beer and liked it. Then they went back to Ireland to do their own research into hot rock mashing in a trough. It went extremely well, and led to their now famous video on You Tube. They wrote an article for Archaeology Ireland and there have been several more articles online since then. The details of their subsequent work are on their web page. They gave a demonstration of the technique at the Sixth World Archaeology Conference in Dublin, 2008. I was lucky enough to be there and it was spectacular. The smoke, the steam, the hot stones and the aroma of the mash! All of these things added to the magic and drama of the demonstration. If an archaeologist is looking for an impressive show of ritual, power and transformation in prehistory, then a hot rock mash ticks all the boxes. One day in the summer of 2009, I got a phone call from Billy. He told me that a trough with grain in it had just been found in Wales. The well preserved trough, with wood lined water channels, was excavated by Dave Chapman of Ancient Arts who went on to do some mashing and brewing experiments of his own. He was successful, as reported in British Archaeology news. We had to try this for ourselves. So far, we had been mashing small amounts of crushed malt in earthenware bowls. It was clear that the 'hot rocks in a trough' technique worked much better. Graham made a small wooden trough, about one third the size of the real ones, and we had some fun mashing with hot stones. It is best to use stones from the land. Rocks collected from the beach explode when being heated in the fire. This is very dangerous. We had an opportunity to mash in the replica trough at Bressay, Shetland in the summer of 2011. The same trough that was used to experimentally wash fleeces. We cleaned it well and luted the corners with local clay, to prevent water leakage. This explains the grey colour of the water in the photo below. There was initially some concern that there might be a problem. It turned out to be the clearest, sparkliest ale we have ever made. Bentonite powder, a derivative of clay, is used today to clear wine and beer. 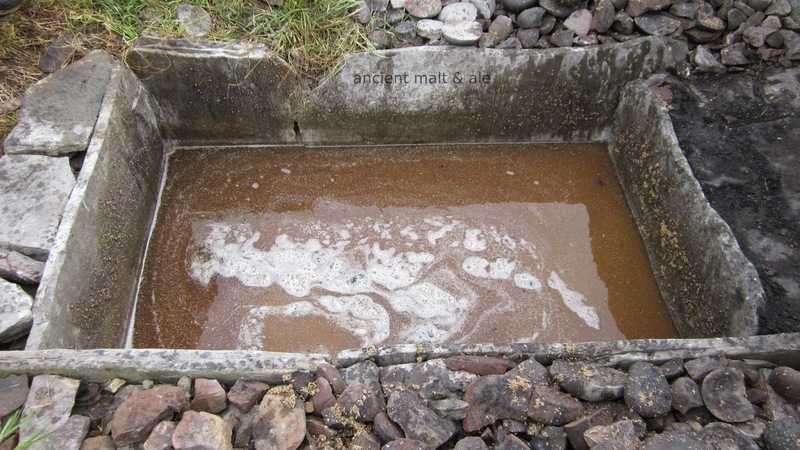 the strike - 50 kg of crushed malt is added to about 250 litres of hot water in the replica Cruester trough, Bressay, Shetland. We used a garden fork to stir it about. A successful mash. Adding a few hot stones kept the mash at an ideal temperature for the conversion of starch into sugar, which took about an hour. We put a piece of wood over the trough for heat retention. crushed malt & water transformed into 250 litres of wort in the trough, enough to make plenty of ale for a feast. cheers! 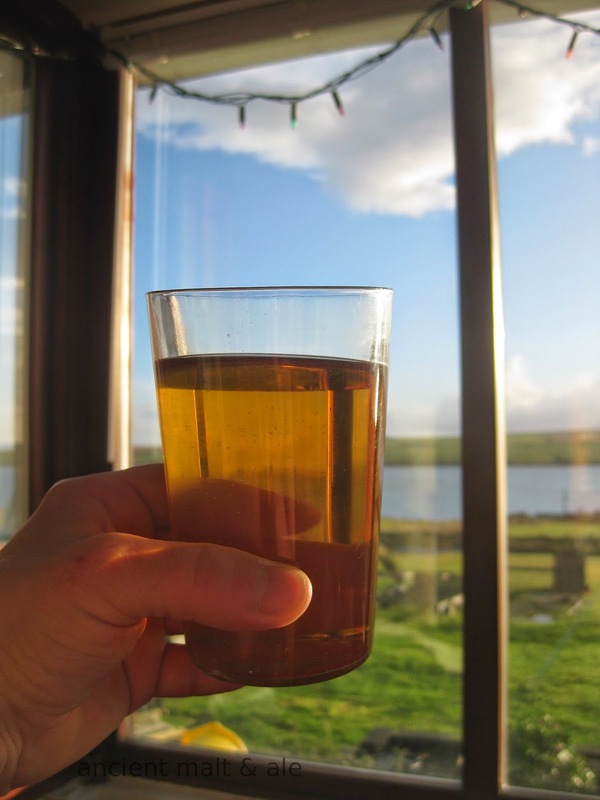 our clear and bright Bressay ale. After taking some of the wort from the trough using jugs, we added brewer's yeast and fermented it for several days. We only had one fermentation vessel, so we could not make use of more than 6 gallons of wort. Next morning, when we went to empty and clean the trough, all the wort had drained away. Only the spent grain was left. Although we had clay luted it, the reconstructed trough is above the local water table. Meadowsweet flowers, about an ounce and a half, were added to the 6 gallons of wort when it had finished fermenting. The result was a strong, clear ale. You can see all the pictures of our Bressay mashing and brewing adventure on my Facebook page. The ale kept really well. We bottled it and sent some to the Past Horizons people to taste. It did take a while to open the parcel, but I think it was probably worth it. There are excavations taking place in Northumberland, not far from Bamburgh Castle, organised by the Bamburgh Research Project. Several burnt mounds have been excavated and archaeomagnetromic dates that have so far been obtained indicate that these burnt mounds were in use during the Neolithic. Pottery finds support this interpretation. The dates obtained so far are 6,230 +/- 50 years BP at 95% confidence. There is a good summary of the excavations here. In December last year, there was much discussion and argument on social media about some neolithic wooden tridents that had been found at a multi period site in Cumbria, which included several burnt mounds. What were these long handled wooden 'forks' used for? Fish prongs? Or maybe they were used for catching eels? Interpretations varied amongst archaeologists. We think they would be a useful implement for stirring the crushed malt into the hot water - the strike. The crushed malt, also known as grist, clumps together when it is being added to the hot water. It is important to stir it about. It is also necessary to stir the mash when you add more heated stones. You don't want to have hot spots, you want to maintain an even temperature throughout the mash. 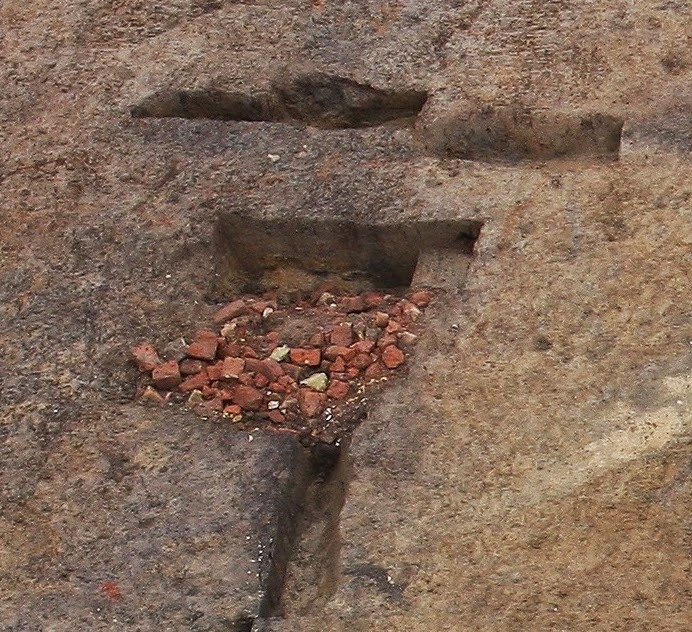 The fork can also be used to move the hot stones about in the trough, if necessary. In the Bressay trough, we used a garden fork. The handle was far too short and a long handled wooden trident would have been ideal. Bishop Arnold of Soissons (who lived from 1040 to 1087) was the patron saint of brewers in Belgium. He is depicted with Bishop's mitre and a mash rake, which looks very much like those neolithic wooden rakes excavated in Cumbria. 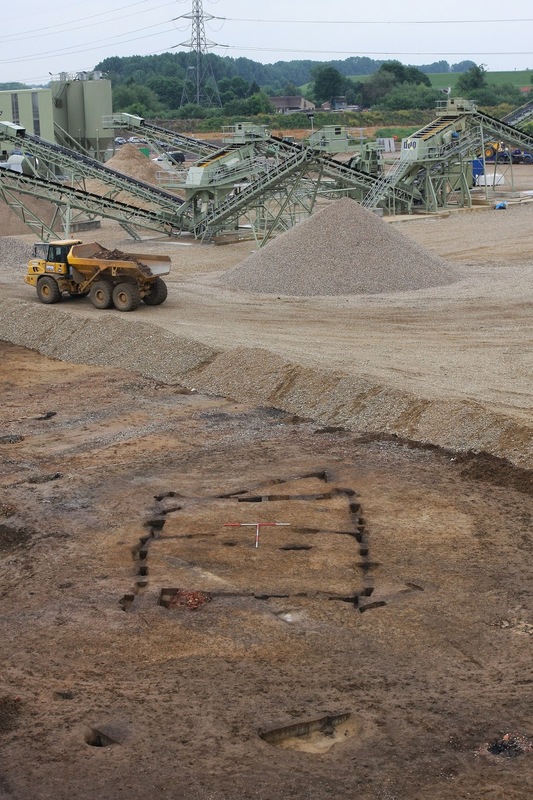 Several neolithic buildings have been excavated at Kingsmead Quarry, Berkshire, England, by Wessex Archaeology. They have been interpreted as houses. This site is another very complex, multi period discovery, with finds ranging from the mesolithic, neolithic and Bronze Age through to post medieval structures. One of the four neolithic rectangular timber buildings, or 'houses' at Horton caught our attention when we were looking at the images online. There seem to be some fire reddened rocks close by the trenches that reveal the outline of the building in the photo below. What are they? They look rather like modern bricks, but the stratigraphy indicates that they are contemporary with the building. Are these stones an indication of hot rock technology at neolithic Horton? If so, exactly what were they doing in and around this wooden building, over 5000 years ago? the footprint of a neolithic rectangular timber building at Horton, Kingsmead Quarry, with a big pile of fire cracked stones. Details of the excavation here. We looked through the reports online but could not find a reference to them. Quite a mystery! Graham managed to enlarge the section of the image with the rocks in and here it is. In close up they look even more mysterious. We look forward to reading the full excavation report to see what the interpretation of these rocks might be. a close up of those mysterious fire reddened stones. We would love to hear your ideas about burnt mounds, troughs, mash tuns and the possibilities of hot stone technology. This technique, of heating water and the mash with hot stones, is so successful that it has been done from the Neolithic to Viking times. Some burnt mounds provide dates that indicate this. Thanks for reading, this post became a bit longer than I had intended.